This is an image I took this last fall when I was in the Boundary waters. I was on a canoe trip with some friends, lugging my camera gear along the way. I even had a tripod with me, and took a few panoramas, but I had not processed any of them until now. As I put this one together, I thought I would give the Color Effects Pro 4 plugin from Nik a try. I had used V3 before, but not that regularly. I had a license key for V4 that I bought a few months ago on a sale, but had never installed it. I decided to download it and give it a whirl. Fantastic is all I can say. It’s great to be able to stack effects from right within the program. If I remember correctly, I did tonal contrast, brilliance/warmth, and polarizer. I am pretty pleased with the result. The sky looks more dramatic, the light on the trees came out, and the near shore was pulled out of the darkness. The only magic it couldn’t pull off was the top right corner. Lightroom says it’s not blown out, but if I tried to darken it, it would block up pretty bad. I decided to leave it alone. I think I might print this one. First of all, you will have to excuse the grainy pictures. I was shooting at f2./8 with the camera above my head praying that I got something in focus. I was shooting at 1600 ISO under the “romantic lighting” as Scott Kelby called it. PS. what’s the deal with both of the subjects putting their right hands up? That’s weird timing. Anyway, you can get an idea for the room, the stage, and the screens showing Lightroom or Photoshop. Ok, let me back up. Yesterday I was at the Light it. Shoot it. Retouch it. 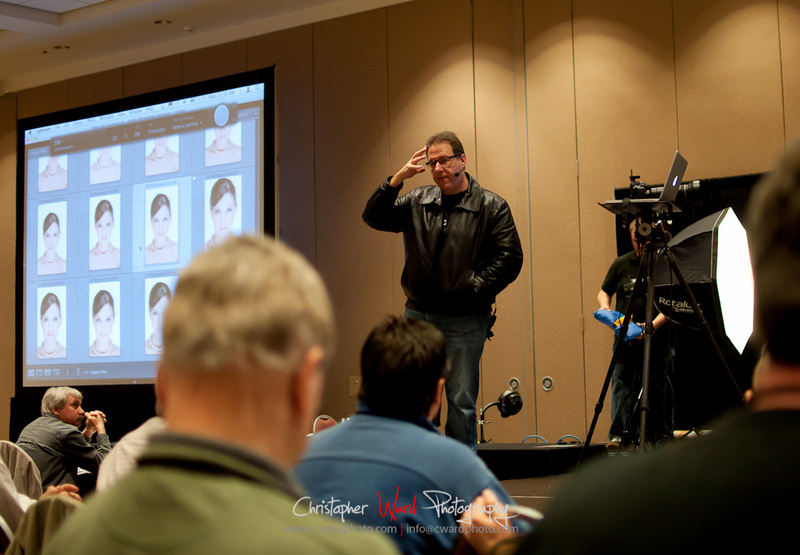 seminar put on by NAPP, and instructed by Scott Kelby. I’ll let the cat out of the bag right up front and tell you it was well worth the day and the $99 (I paid $79 as a NAPP member) cost. The event was held at the Minneapolis Convention Center. Despite it being a huge room with a ton of people, I think the setup worked really well. I got there early enough that I got to pick a seat fairly close, but I think even the folks toward the back wouldn’t complain too much. There was a thrust stage that the NAPP folks were concerned that Scott would fall off of. He would shoot from the end of this back toward the end of the room with a large backdrop setup. He was shooting tethered into his computer, and the images he took would display in a couple of seconds up on two huge projector screens on either side of the stage. I took this picture only a couple of hours before I was sick for two weeks. Yup, I was up on a roof in a t-shirt freezing by the end of the shot. When I came down from the roof I was shivering uncontrollably, and shortly after that I was spending way too much time in the bathroom. It was taken in Nepal, in a little town called Bandipur, down a very windy road west of Kathmandu. I was on the roof of the guest house we were staying in. This is a multiple exposure image. I was shooting at f/4.5, ISO 200, for 5 min per exposure. 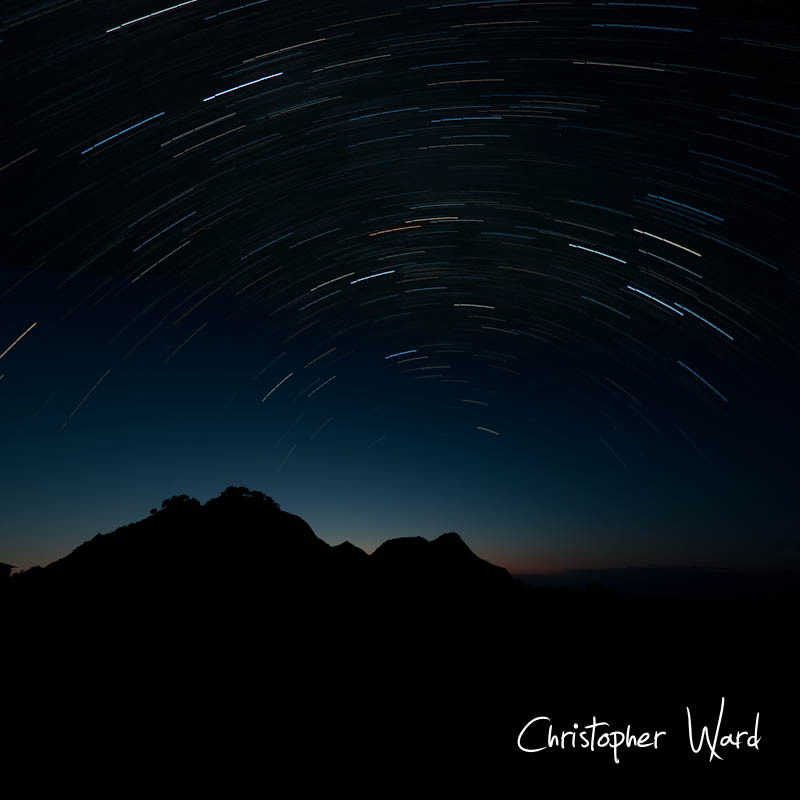 I took seven pictures of star trails from the same roof that a couple of hours earlier I had taken the sun setting in the mountains picture. I used a simple cable release, and a timer. I then put them together in Photoshop. They went together quite easily. I just stacked the layers and set the blend mode of each layer to screen. That worked well for the star trails, as only the stars show through, the black sky doesn’t, and you have the trails. I then added more canvas room to the image, put the stars at the top, the mountains at the bottom. When I had them lined up how I liked them, I had a few stars in the mountains. I then created a mask, and applied a gradient to the mask, white at the bottom , black at the top so the stars didn’t show up on the bottom. I played with that a bit until I got it looking the way I wanted. Thats it. I have wanted to play with star trails before, but it is amazing how little light pollution it takes to ruin the image. Anyway, it was fun.